On this day, going out of the flood of life, carrying you from the today into the tomorrow, excluding from routine, concentrating and looking to the sides, one begins to discern some "hazy silhouettes". Soon you will understand, that there are questions, which always were, but the current matters have pushed them into the background and there was no time to hear their quiet rustle. -Which meaning do you invest in the word "keep the memory of the Holocaust"? -Why are you doing it? -If you remember the victims of the Holocaust, can you refrain from remembering the hangmen? -They say: "I forgive them, but I can't forget anything". How is such a state of consciousness possible? -How keep the memory after me? He who earlier has devoted himself to such questions knows, that the answers depend not only of the personal history of every one, but also from this, that with time the attitude towards the Holocaust has changed. Therefore sometimes it is worthwhile to reconsider. — In the discourse about the Holocaust the accent is constantly moving from the Past to the Future and from the memory of the Holocaust as only the tragedy of our people to the world-wide meaning of the Holocaust (Imre Kertes: "…after Auschwitz nothing yet has happened, to refute it. In my works the Holocaust never was represented in the past time". Zigmunt Baumann: "I understood that the Holocaust is not a picture on the wall, but a window to the world, through the which we can see the dangers threatening us"). Certainly, these tendencies exist side by side with the traditional attitude towards the Holocaust and are pictured differently in various countries, various social layers, various generations. They influence meanings, organization and contents of the activities to upkeep the memory of the Holocaust. Below – two little notes to the subject. On the page 2 several answers to the "hazy silhouettes". These questions ... how would you answer them? Our apologies: the Association is a non-commercial organization and we are not able to translate into English the complete text. And so "to be continued" (or "more") links point to the complete text in Russian. We ask the bilingual readers, who will translate for themselves to English, to share the translations with our site and Journal. "How could something like that be possible? There is no reply…"
This clear or unclear "question without answer" usually is completed with the discussion, connected with the memory of the Holocaust, be it in our forums, in our memories or in private dialogues. However nowadays this question, as a rule, expresses only an emotional state of mind of the inquirer or respect for the ritual: Little are those who really want to get an answer and undertake something for it. And those among us who want, seek it in history – in his personal one, as well as in the "big" one of the Holocaust. But there has already amassed so much historical-graphic material about the activities of the occupants and collaborators of various kinds in all the territories occupied by the Nazis, already discussed are the forerunners, the incentive motifs of those inspired by and fulfilling total terror, the suffering is described, cases of resistance and heroic behavior of Jews, composed are artistic works of all kinds of genres "according to motifs" and without motifs and so forth, so that addition of our details little changes the general picture. Anyway, there are no replies… Imagine for a moment: The answer is known – what do you need it for, how do you use it? Perhaps answer is necessary, but on the basis of information known to us in principle it cannot be received? Does It mean that "the general picture of the Holocaust" built by us is not fit as a basis for reply? Or do we know some answers but they do not satisfy us? If so, then why? If the question gets constantly repeated, can one assume, that it is not only a part of the ritual, but has (or has had earlier) a constructive meaning, hidden in other, intuitively understood, but as yet un-mastered by us contexts? Perhaps it is a question about the present-time meaning of the Holocaust and then it behooves us to address it to the Future: "how could anything like that be possible?" This is just the opinion of Sigmund Baumann. I think that today such a posing of question is much more important for life than everything, that we understood or knew until now about the Holocaust. I have to tell you that this, with which we grew up - "never again" - begins to sound like "ever anew". Jonathan Sacks, chief rabbit of Great Britain, 2013. Thinking about the trauma of Auschwitz, I come close to fundamental questions about the ability for life and the ability to create of contemporary man; and thinking about Auschwitz exactly like that – let it look paradoxical – I think, not about the past, but about the future. Imre Kertes. A former prisoner of Auschwitz and Buchenwald, a writer. 1.What are we doing this for? I feel a DUTY to tell the TRUTH. A Duty in front of the perished relatives and tribesmen. A Duty facing the children and the grandchildren, and the grandchildren of the grandchildren. A Duty to carry one part of one's Truth and the general Truth of the tragedy of the Jewish people. It sounds like pathos, but I think this is a necessary work, and now particularly relevant." In Israel an important event took place, connected with the Second World War and with the Catastrophe. 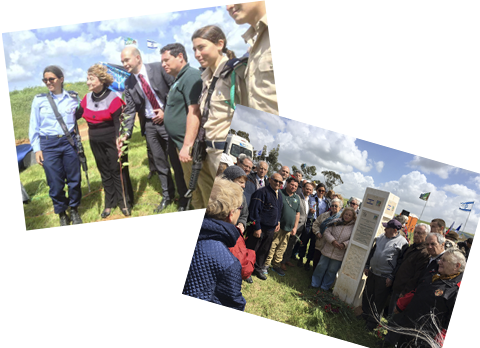 Owing to the press, the radio and television hundreds of thousands of people were informed, that a planting of a Memorial Grove in memory of one and a half million children expiring in the years of the Holocaust takes place. A short pre-history, preceding this event. At the end of last year the President of the worldwide organization "Survivors from concentration camps and ghettos" Gita Koifman initiated a project. The central council of the organization unanimously supported it and started realization. Step by step, Gita Koifman settled complicated organizational questions by actualization of the project. The main questions was getting a piece of land. Gita found people who thought like her in the management of the Jewish National Fund (Keren Kayement le'Israel), taking the decision to allot such a plot for the plantation of no less than 1000 trees. In search of a suitable location, members of the Organization-Committee were in the South and North of the country. At this time in the city organizations there worked groups, revealing those who wanted to participate in the plantation of the Memorial Grove, composed a list of those who perished in the SHOA, collected donations to the fund of KKL. And there – this day began. March 15, 2015 to the valley of Rohama in the Negev there came hundreds of members of the all-Israeli association "survivors of the concentration camps and ghettoes", their relatives and friends, in order to honor the memory of one and a half million children, killed during the SHOA.